Ode To Joy and A Cool Breeze. A technical difficulty in the Ode To Joy And A Cool Breeze post tripped up the YouTube link but it’s back in business, enjoy New Order! 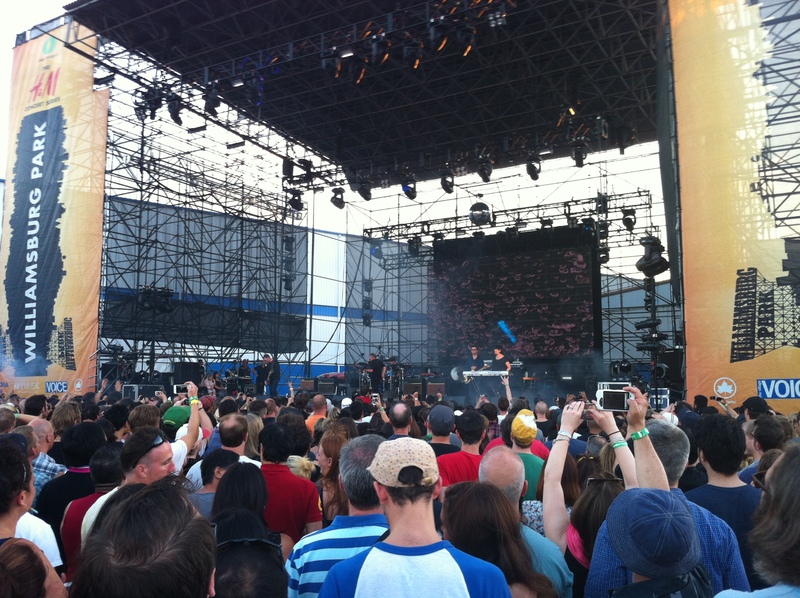 A different post was all up and ready to go for today but I caught New Order’s concert on the waterfront in Williamsburg Park last night and…screw it, I’m going with this trip down memory lane. This entry was posted in Uncategorized on July 25, 2013 by portsarecalling. 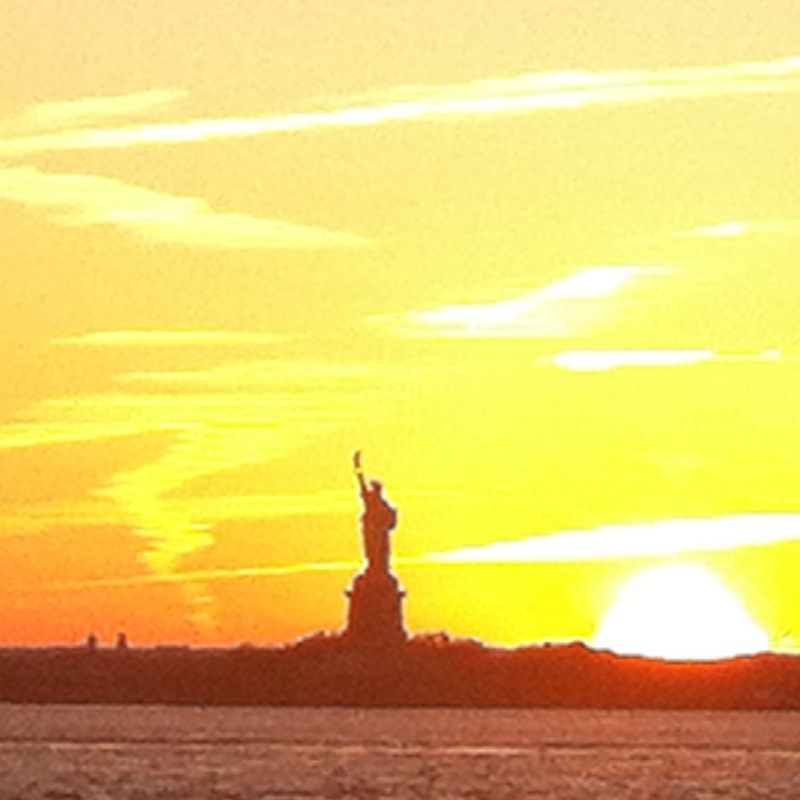 Yesterday, even the heat got tired of itself and New Yorker’s were treated to a picture perfect night. The sun was just starting to dip, I heard The Human League booming and gladly crossed the border to the land of flashbacks. I bopped along in the line to get my neon green I.D. bracelet stamped with “Enjoy ★ Heineken Responsibly” and kept moving. Traveling with a pack, we grabbed our Brooklyn Lager and expertly snaked our way through the masses, moving smoothly like water through a river rock run until we were close to the stage. To the north, a tumble of clouds hung in the distance like a mountain range, or maybe I was just seeing things. Strong, cool summer breezes off the East River blew in all around us, a killer sunset was coming down and then the band came on. New Order takes the stage, July 24, 2013. If you’re a fan of New Order then I’ve got no explaining to do. If you aren’t too familiar, let’s just say they were their own particular style of music in the ‘80’s and one of the best British bands to come out of post punk’s ashes. Originally members of Joy Division, they salvaged their talent after their lead singer opted for a dirt nap. New Order created its own brand of alternative, electronic music that wasn’t mainstream by a country mile. But you’ve probably heard at least one of their songs, maybe Blue Monday, one night when you were out dancing in a club or at a wedding. The rhythm and beat of that tune wormed its way into your head, making you bounce and groove in ways you never thought possible. Last night they were loud, they were proud, and they had the crowd in the palm of their hands. It was finally dark, the air was cool but the place was pulsing, it was full transmission. I saw some old faces and some old dance moves. New Order played all their classics and in the end they stoned us with some Joy Division. Williamsburg Park is a misnomer but even the lot we stood in seemed to morph into a perfect venue listening to those retro sounds. After 23 years, these Brits still know how to do it and have some North American shows left if you’d like to catch them. Staycation’s wonderful but you can keep your couch, keep your air conditioning, and keep your Netflix. I’ll take an old school park concert anytime. Whatever kind of entertainment moves you, summer’s nights are calling you to come out and play. Share what’s happening in your backyard. Click here if the image above doesn’t take you to a taste of last night’s show. This entry was posted in Claudia's Trips, Uncategorized and tagged alternative music, bands, British, Brooklyn Lager, concerts, East River, electronica, entertainment, flashback, Love Will Tear Us Apart, music, new wave, North America, outdoors, post-punk, summer nights, tour, waterfront, Williamsburg Park on July 25, 2013 by portsarecalling. In the midst of setting up some new posts, I got a nice surprise. 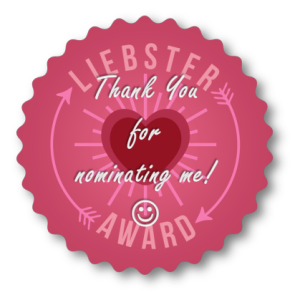 Fellow travel and lifestyle blogger Here To Conquer nominated me for the Liebster Award! This award is a good will token. Liebster is German and means sweetest, kindest, nicest, dearest, beloved, lovely, kind, pleasant, valued, cute, endearing, and welcome. Here To Conquer is on the road ride now but take a break and track her travels. I truly appreciate the nod from her. This award is given to new or up and coming bloggers who have less than 200 followers. The award is then passed along to other bloggers in the same category to help spread the word and support one another. Choose 5 new bloggers (with less than 200 followers) to pass the award to and link them in your post. Name a secret talent that you have? I can’t tell you, it’s a secret. What activity would you want to try but are either too intimidated/shy/unsure to try? Parkour–because how cool would it be jump around like that? Have you visited any of the Wonders of the World yet (from any of the lists)? Yep! If you have, which one? The Great Pyramid of Giza. What is your favorite sport? Skiing. What is the one piece of advice you’d offer to someone younger than you? Don’t get sucked in by mainstream culture—do what you love! What is your favorite book? That’s a tough one, there are so many so I’ll give you my latest favorite, A Drinking Life by Pete Hamill. If you could live anywhere in the world for a year, where would you choose? Hard choice but I’m going with South Africa. If you could meet anyone in the world, who would you choose? Jesus, because I think we could talk the night away and I’d really like to know what he said before his words were edited. If you could pick a theme song to play every time you entered a room full of people, what would you choose? The Hokey Pokey. If you could be fluent in any language, which would you choose? Italian — no matter what they’re saying, it always sounds so good. Pizza is #1 (water’s gust a given) on my desert island food list. I like hearing the sound of a motorcycle rip down the street on a hot summer night. I like hanging out in cemeteries. I’m up for a karaoke anytime. I’ve got a thing for Michael Fassbender. I don’t abide guacamole that’s not fresh or a bad margarita. I play guitar but not as well as I’d like. I’ll take a vampire or werewolf any day but please don’t show me a zombie. I’d like nothing better than to read, write and ride horses. Nilly Writes – This is a poetry blog. There’s no “About Me” section on it but it seems to be written by a teenager who’s trying to articulate the whirlwind of emotions we all go through at that time in our life. From Swerve of Shore – Amazing and eye-catching travel photography from a documentary photographer from Vietnam. i. Am. RAWR. – Beautiful writing that captures the random thoughts and introspections we all have in a beautiful way. The most recent post on loss — Good Bye, Good Dog, really got me. From Novels To Board Books – A reading junkie, with a mission is to instill the same habit in her baby boy. Her writing is fresh, familiar, fun and she inspires writers to keep that pencil – or keyboard – moving. Days of Hilda – Reading Nikki Reed is like hanging with an old friend. If you could be any creature in the insect world, what would you be and why? Do you play any musical instruments? If yes, what? If no, what would you like to play? If you could be any character in a book, who would you be? What’s the number one item (besides water) on your desert island food list? Pick your favorite, sunrise or sunset? Who’s your favorite band or musician? If money was no issue, what would you do, where would you live? This entry was posted in Uncategorized and tagged awards on July 23, 2013 by portsarecalling. Get Your Flicks and Kicks. 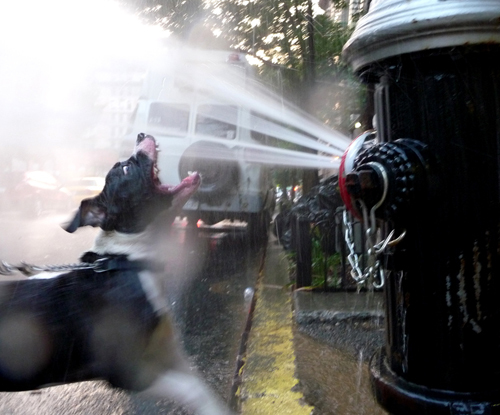 Spending the dog days of summer in New York City can be…hellish. Anyone who’s already used up vacation days, or can’t spring for one, knows that when it sizzles like this there are few options to stay cool. But nothing’s worse than holing up in your apartment with the air conditioner cranking, missing out on the spectacular neon-pink sunsets and warm breezes of these hot summer nights. 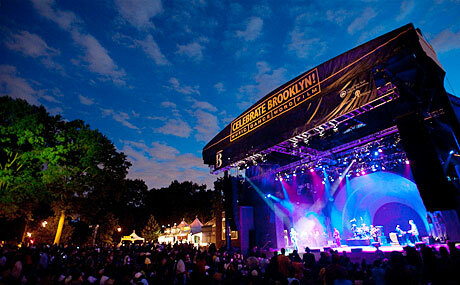 Luckily it seems like this season nights in the city—and the surrounding boroughs of Brooklyn, the Bronx, Queens, and Staten Island— hold some pretty cool offerings for outdoor music and entertainment. The best part is, plenty of it is free and depending on where you go, you can bring your own food and drink. 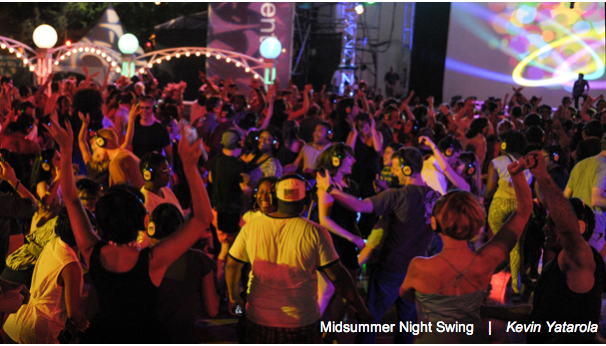 Last week, I—and hundreds of fellow New Yorkers—danced the night away at a silent disco that was part of the outdoor Midsummer Night Swing series at Lincoln Center. Dancers and spectators wore a perpetual grin, and the place was rocking. Whatever side of the floor you were on, the night was magic. 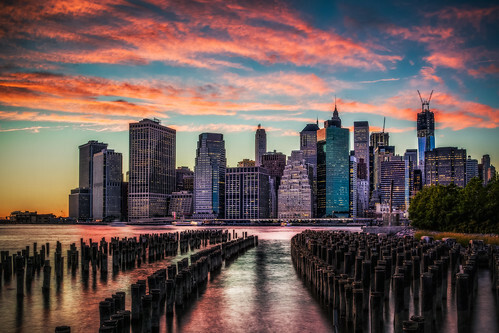 From opera to jazz, folk, rock, world music, or classical, you can still catch some of the best performances and musicians at the Free Summer Concert series happening all around the town from Central Park to Van Cortlandt Park. Beck will play a benefit concert in Brooklyn’s Prospect Park on August 4th. It’s sold out but don’t let that stop you. Pitch a blanket on the grass outside the bandshell and you can still enjoy the show. The Central Branch of the Brooklyn Public Library offers culture and arts events. Check out their unique book and writer discussions on the likes of Gabriel Garcia Marquez to Norman Mailer, or stomp the night away at their outdoor Plaza Swing Series. Drive-in movies may be a thing of the past around here but luckily you can catch a flick in the park or on the beach. From Wreck-It-Ralph to Argo, Free Summer Movies is a great back-to-basics way to enjoy a hot summer night. A special shout out goes to Coney Island, The Rockaways, and Staten Island. These areas are showing true grit in rebounding back from the beating they took from Superstorm Sandy and are running movies for folks of all ages. Last but not least, today is Nelson Mandela’s 95th birthday and the folks at Madiba, the South African restaurant, will throw their annual celebration. “This restaurant was built on Nelson Mandela’s ideals of love,” said Madiba manager Denis Du Preez. “It doesn’t matter if we light a candle, put a flower out or just put up a picture on his birthday—it’s about the people who come here and rejoice with us and celebrate our hero.” Starting at 6:30pm, they’ll be pouring free Brooklyn Lager and will release lanterns into the night sky. The town is hot! Throw on your shorts and flip-flops and celebrate the summer nights—and don’t forget your good will, and blanket or beach chair. Wherever you are, stay cool and enjoy! This entry was posted in Claudia's Trips, Uncategorized and tagged air conditioning, beach, beach chair, blanket, Brooklyn Public Library, Bryant Park, celebrities, Central Park, dancing, drive-in movie, film, flip-flops, Gabriel Garcia Marques, heatwave, Lincoln Center, Lovin Spoonful, Midsummer Night Swing, movies, Norman Mailer, outdoors, parks, Plaza Swing Series, Prospect Park, shorts, silent disco, summer, summer nights, tourist, Travel, Van Cortlandt Park, writers on July 18, 2013 by portsarecalling. Biking around Prospect Park in Brooklyn this morning, I heard the unmistakable drone of bagpipes floating across the road. It was around 6:30am and the air was already thick with humidity. 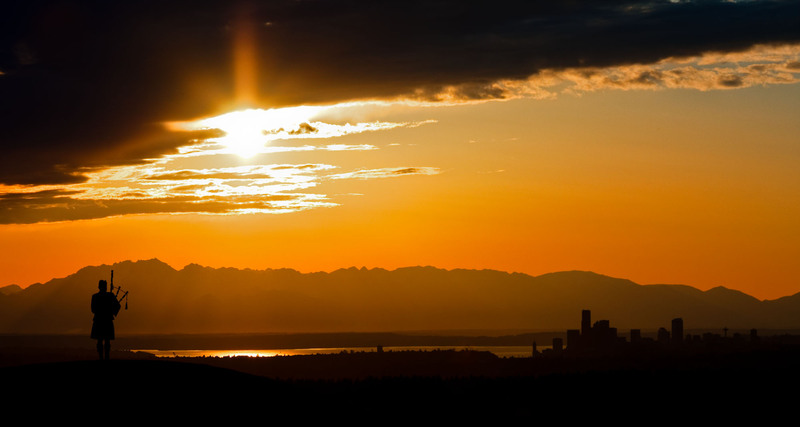 Eighty degrees and climbing, a hazy sun was quickly disappearing into a swirling blanket of thunderclouds. The bagpipe is an instrument that some people love or that drives others nuts. I slowed the bike and swung back around to listen. Beyond a cluster of bushes and trees, someone was playing a bagpipe, and its sound was brilliant. Turning into a little lane that curved towards a small brick building, a balding man with a shock of white hair stood playing. Are you just practicing or getting ready to blow for a funeral, I asked. With lots of cops, fireman, and Irish-Americans in Brooklyn, it’s common for pipers to play at these services. “No,” he said in a thick British accent, “my son’s getting married this weekend and he’s asked me to play at his wedding.” He was from Hammersmith, outside of London, and was enjoying the opportunity to practice in this secluded spot. He asked if I’d take some photos of him playing, and handed me his camera. A few minutes later, a jogger came huffing and puffing into the little haven and asked, “Are you playing Dvořák’s New World Symphony?” The piper nodded and smiled. “I’m from the Ukraine, I recognized it immediately…thank you,” he said and jogged away with a big smile. I couldn’t have named that tune, but for a moment it felt like I was in a small park in Europe. There was some kind of strange magic in the air. It’s very beautiful, I said, and asked him how he was enjoying Brooklyn. “It’s wonderful, a great melting pot,” he said. I waved goodbye, telling him there’s no place like Brooklyn. He picked up his bagpipe and belted out the opening chords to Yankee Doodle Dandy and shouted, “I’ll be playing that when the bride walks down the aisle.” Then I rode away with a smile, with those pipes humming in the air, back into my homeland. Dedicated to Beth (Hendry) Annunziata…the pipes, the pipes are calling. This entry was posted in Claudia's Trips, Uncategorized and tagged Bagpipe, bicycling, Brooklyn, Dvořák, Europe, Hammersmith, Irish American, London, music, New World Symphony, Prospect Park, Robert Frost, Travel, Ukraine, Yankee Doodle Dandy on July 11, 2013 by portsarecalling. When we think of travel, the words happiness and freedom often halo the thought. In America, traveling for pleasure didn’t begin until after the Civil War and only the rich could do it. Anyone fortunate enough to travel these days most likely doesn’t give thought to the genesis of the idea of “vacation.” We travel to free ourselves in some way. Travel is escapism. Yes, it can be all about rest and relaxation but one of the benefits of travel is that—if we allow ourselves—we break out of our own world and glimpse it through the eyes and lives of others. We may not always like what we see but it can give us a better understanding of who we are, what we cherish, what’s important, and what matters. A Swiss chef I once worked with told me that Americans don’t appreciate their freedoms. This was a long time ago, and I didn’t really understand what he meant back then but over the years I get it. This past week, at The New York Public Library on 42nd Street a rare exhibition of two of the most important American historical documents were on display together. Anyone interested could see an original copy of the Declaration of Independence and one of the original copies of the Bill of Rights. With the 4th of July approaching, I figured I could use a refresher on the documents that form the foundation of freedom in the United States. As kids we learn about them in school but as we grow older we forget about them. About what they really mean and the collaboration it took to get those ideas on paper. We forget that pretty much everything we can do, including travel, was built on the bedrock of these ideas and the history that followed. Let’s start with the Declaration of Independence. It’s written in iron gall ink on handmade laid paper. There’s hardly anything that we use that’s handmade anymore, so I was impressed just peering at it. And I hardly know of anyone who writes by hand these days, and Thomas Jefferson’s is beautiful. The Bill of Rights displayed is one of 14 original copies. Aside from the obvious aesthetic worth of these documents, their true value was evident by the amount of international visitors, and Americans, in the gallery. These manuscripts are slightly faded, and you have to either be really young to read them or have great eyeglasses. But it didn’t matter. You could hear people reciting sections from these documents and it gave me chills. A black man who lives in Washington Heights said he wanted to see them because his family hails from South Carolina. There is slave blood in his veins and he wanted to view Jefferson’s original, unedited, version of the Declaration. The power of these documents generated energy in that room and I felt proud. They were giving away copies and I snatched one up. Today is a holiday for a reason. Before you jump on a plane or in a pool, raise the sails, or fire up the grill, kick back in a hammock or crack open a cold one, maybe take a moment to thank Adams, Franklin, Jefferson, Livingston, Sherman, and Madison, who had the intelligence, foresight and the good sense to create these documents and hook us up in a very big way. 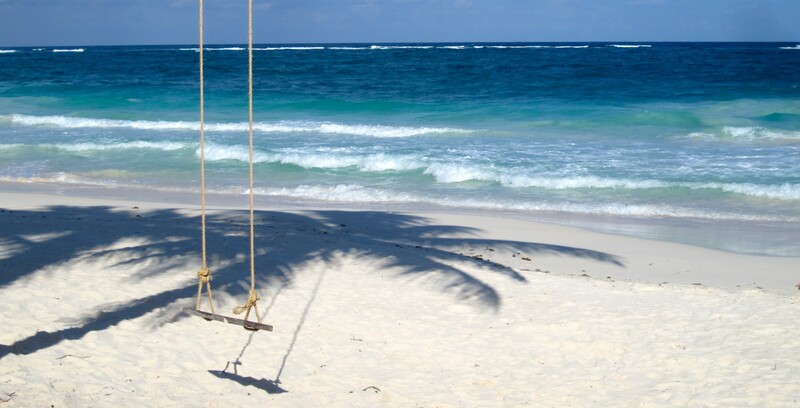 Wherever you are, here’s to catching up with freedom and happiness. Here’s to a Happy Independence Day! This entry was posted in Claudia's Trips, Uncategorized and tagged Benjamin Franklin, Declaration of Independence, freedom, grill, happiness, Independence Day, John Adams, liberty, New York Public Library, plane, pool, Robert L. Livingston, Roger Sherman, sail, South Carolina, Thomas Jefferson, Travel, United States, United States Declaration of Independence on July 4, 2013 by portsarecalling.